This is a hydra. See below under hydra for some more photos. Note, 10/19/07: I am in the process of moving this page to the animals directory. This page has not been reviewed (read), divided, updated, links checked, etc. as of yet so there may be errors. These are the books that I own and that I used as references for this web page. Pond Life: A Guide to Common Plants and Animals of North American Ponds and Lakes by Dr. George K. Reid, Golden Press, 1967. A book chock full of information. + Knowledge I have gained and stored in my brain. Microcosmos - a new Dutch site (in English or Dutch via here) on all sorts of small fresh water animals. Biomedia Associates - includes photos of some aquatic micro-critters. Pond Life Identification Kit - A "simple guide to small and microscopic pond life." This UK-based site has information and microscopic photos of lots of micro-critters! 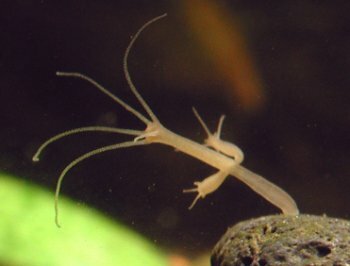 Aquatic Life - a page on freshwater worms. Microorganisms - includes some real photos of daphnia, brine shrimp, water mites, hydra, cyclops, etc. Bugs and Worms Part I and Bugs and Worms Part II - Some information and photos on daphnia, copepods, rotifers, hydra, planaria, leeches, and removing them. What's that stuff in the water? Ron's Pond Scum - microscope photos of pond microorganisms.